Permanent liquid haircolor with intense saturation and lacquer shine. • Gel consistency for quick application. • New low ammonia base with 100% gray coverage. • New advanced red dye technology for the most vibrant, long-lasting reds. 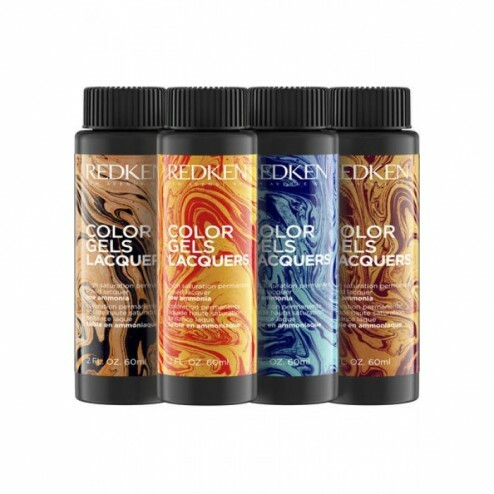 • New formula is used with Redken Pro-Oxide Cream developer. Color Gels Lacquers is the perfect pair with Shades EQ Gloss! Easy 1:1 refresh with matching shade names; Alkaline Color Gels Lacquers on Zone 1 (regrowth) and acidic Shades EQ Gloss on Zones 2 & 3 (midlengths and ends) for maximum color results and minimum stress on hair.